Let’s call this the battle of the animated animals. NO, the battle of the genre’d animated animals. In one side of the ring we have Blacksad, the noir graphic novel starring a giant black feline private eye named John Blacksad. In the far side of the ring, we have plucky Rango, a laissez-faire chameleon who ends up deep in the heart of a Western movie. 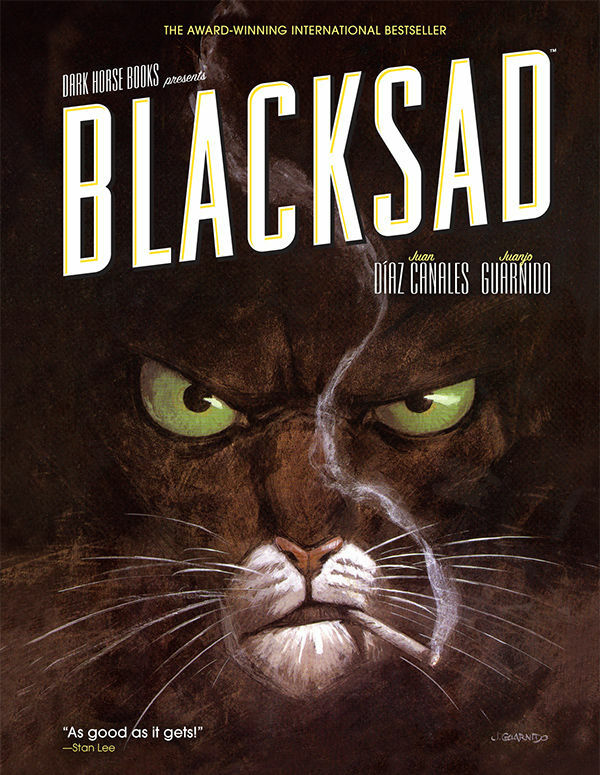 Blacksad will draw you in with its art, done by Juanjo Guarnido, a Spanish-based illustrator who used to draw for Disney. For adults of a certain generation, this means all of the animals feel slightly familiar, like they are echoes of childhood animated movies you can’t remember. Of course, the effect can be a bit creepy, as these are meant for adults, and there are definitely some adult situations for your run-of-the-mill cartoon dogs and cats. The book it reminded me of most was Maus, the Pulitzer-Prize winning Holocaust memoir by Art Spiegelman. Blacksad doesn’t address the same dark issues, or have the same level of sophistication, as Maus, but several plot points rely on the “species as race” divisions for their conflict. As far as the stories go, if you’re a fan of private eyes and the like, you’ll be well pleased. It’s really the amazing illustrations that set Blacksad apart. I’d recommend it to any casual comic reader to show that there really is something for everyone. In all honesty, I caught Rango on a plane, so I may have missed some precious jokes. Rango is crazy. Director Gore Verbinski must have got real sick of the pirate genre, because he crammed every film reference he could into his first animated movie. It was more Tarantino than Tarantino; I counted: Apocaplyse Now, Fear and Loathing in Las Vegas, Chinatown, The Big Lebowski, True Grit, any spaghetti western you can name, and, indeed, Pulp Fiction. A tangent that shall become related soon enough: my dad always used to complain about kids’ movies that pander to the adults that have to watch them too (Shrek being a key culprit). Watching this movie, with its filmbuff asides and prostrate jokes, did make me wonder who this film was for (sleepy twenty-somethings on planes?). Luckily the characters have enough loopy charm (although Johnny Depp! are you ever going to play normal again!) and the plot is just simple enough that the film works. Plus, the animation is really captivating, with scenes of a (rodent-sized) Western town and the surrounding desert. I’d say Blacksad by the whiskers of his chin. Check out the Dark Horse preview for Blacksad. Here’s a behind-the-scenes video for Rango. Ugh. I have a stack of books towering on my bedside table. They are part of the New Regime (resolution-style), and they are all good for me (Zen! Shakespeare! Financial management!) but they are certainly not FUN. My eyes were even glazing on BART over reading The Street of Crocodiles, by Bruno Schulz, which is very lovely but meandering. Lucky the SF Library pulled through at exactly the right time! I finally received Julia Wertz’s Drinking at the Movies, a graphic novel memoir, which I requested months ago. Anyways. Wertz’s memoir chronicles her move from SF to Brooklyn, and as I live in the beginning end of her journey, I didn’t find as many places to squeal about. (Although her cliches about the Bay were pretty apt). It’s the mid-20s crisis that especially hits close to home for me. What the heck am I supposed to be doing? Is everyone else this aimless? Why can’t I get paid for drinking beer and watching tv in my bed? Wertz has an open, if not entirely friendly voice and drawing style to accompany those of us struggling in your twenties (and if you’re not struggling, I DON’T WANT TO HEAR IT). Her own life has a few more curveballs, as her brother is a recovering addict and her own relationship with alcohol suggests addiction might run in the family. But it’s a wry, frank, and funny take on that time in your life when you not only don’t only know how to put on your bootstraps, you don’t even know what bootstraps are. I’m determined to check out her earlier work (which takes place in San Francisco!!! ), Fart Party. Here’s her website, and blog, and stuff on Amazon.